This Is a documentary about life and struggle of people for becoming professional gamers. Spend a year in the life of one of America's most innovative classrooms. Jon Stewart: I am a Times puzzle fan. I will solve, in a hotel, a USA Today, but I don't feel good about myself when I do it. This delightful documentary, directed by Patrick Creadon, is a dream come true for people that enjoy to solve crossword puzzles. It centers around Will Shortz, the current New York Times editor, who has revolutionized the way we do the puzzles today. The film was co-written by Christine O'Malley, who with the director, takes us to meet some of the people behind the scenes. We must make a confession from the start, we are one of those addicted to solving the daily crosswords in the paper. The New York Times puzzles are the best of all the ones published by any newspaper. Of course, we are not in the league of the likes of Tyler Hinman, Trip Payne, or Al Sanders, who were the three finalist in the 2005 competition, but we are happy with just the idea of solving them every morning. 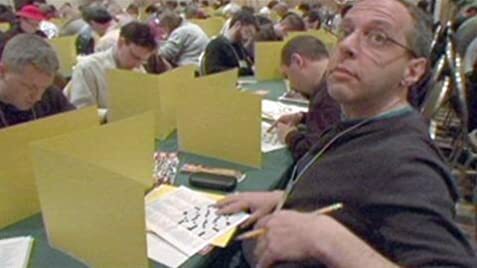 There are many personalities that speak about their addiction to the crosswords of the New York Times. Among them, we hear from former President Bill Clinton, a man that has always been notorious for his quick mind. David Okrent, the former public editor of the Times, makes a surprise appearance. Jon Stewart is also funny in the way he deals with clues and how he blames Will Shortz when he doesn't get them. Mike Mussina, The Indigo Girls, Bob Dole, and other celebrities also are seen. The great fun of "Wordplay" is watching a master constructor of the stature of Merl Reagle creating a daily crossword right in front of the camera, and explaining the logic behind it. There is a funny moment when Ellen Ripstein, a former winner, tells us that in spite of having won, she keeps going every year to participate in the tournament. Her performance in the entertainment part of the competition brings a light and goofy moment to the film. 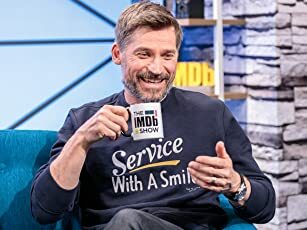 The only thing we don't get too much of is the master himself. Will Shortz appears all too briefly as the emphasis of the documentary seems to be the annual competition at the Marriott in Stamford. Some of Mr. Shortz observations are funny, especially when he shares his typical weekly correspondence from frustrated people that are "puzzled" by his clues. 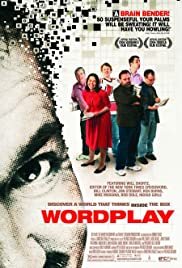 "Wordplay" is a film that will resonate more with crossword puzzle lovers, but it is a fun movie to sit through because the witty material and the pace it was given by its creators.